A Loughborough University London project, which challenges students to help solve real problems set by a wide variety of organisations, was celebrated at an event last week. On Thursday (1 March), staff, students and company partners heard the outcomes and achievements of the latest Collaborative Project module ahead of its completion this spring. The Master’s initiative, which commenced in September last year, has seen more than 660 postgraduate students work in 122 multi-disciplinary teams to deliver on tasks set by 19 organisations. From helping London Stadium with its goal to become the most connected stadium in the world to suggesting ways EDF Energy Blue Lab can enhance home battery appeal through augmented reality, a variety of challenges were presented to the students. NHS England asked students to think of ways to enhance appropriate usage of A&E and support international students to better utilise services. The teams carried out qualitative research and suggested concepts such as an online network – supported by health professionals – for carers of the elderly and an NHS workshop for international students during Welcome Week. A spokesperson from NHS England said they were “very impressed with the students’ dedication and enthusiasm” and hope “the outputs can be developed further to contribute towards improving healthcare services”. Companies that also took part in the module include award-winning architects Foster+Partners, BT Sport, Manifesto and independent creative agency HeyBigMan!. The ‘Collaborative Project Show 2018’, which was held at Plexal, was opened by Dean of Loughborough University London Professor Mike Caine. Professor Caine commented: “The Collaborative Project is, globally, one of the largest programmes of its kind. It brings together students from different disciplines, nationalities and cultures to address contemporary challenges set by a wide range of organisations through team-based action-learning with a focus on creativity and innovation. 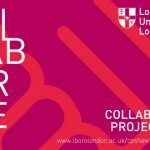 The Collaborative Project, now in its third year, is open to all full-time and part-time students at Loughborough University London. For more information on the module or how to become a collaborating organisation, click here. A YouTube video of the Collaborative Project 2017/18 can be found here.